A black and white negative of a destroyer docked in the harbour in Miami, Florida on February 15, 1939. View is of the bow of the destroyer. People can be seen standing on the dock to the left of the ship. 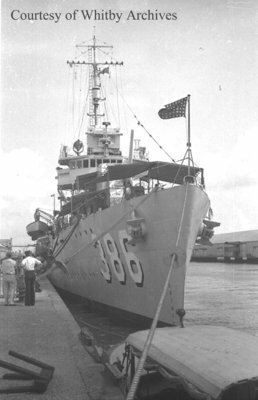 We believe the destroyer to be the USS Bagley (DD-386). Destroyer in Miami Harbour, February 15, 1939, Marjorie Ruddy. Whitby Archives A2013_040_627A.